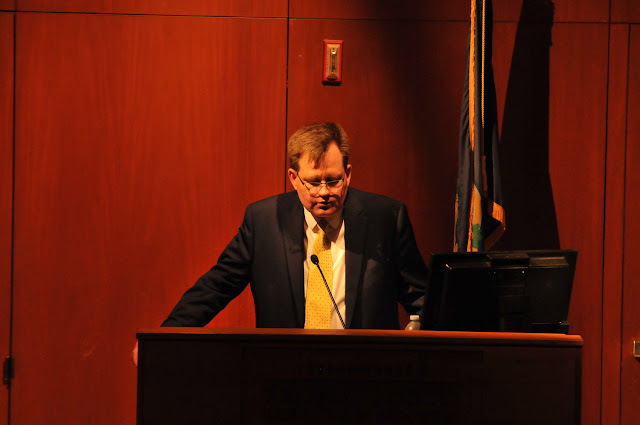 Dr. Keith Whittington’s discussion of free speech on college campuses Wednesday night came on the heels of a string of controversial speakers that came to the University of Connecticut last year. Dr. Whittington, a professor of politics at Princeton University and author of the book “Speak Freely: Why Universities Must Defend Free Speech,” offered a relevant and neutral take on the role of the modern university has in the complicated task of accommodating opposing views and the value of higher education in general. “It is difficult to listen to those who disagree with us,” Dr. Whittington said, an idea which he reiterated throughout his presentation. “(But) it is important to accept ideas even if we do not tolerate them ourselves.” He made a distinction that the problems society faces are not unique to our generation. Instead, they are the general problems of Americans living in a liberal society. Dr. Whittington spoke of the unique role of colleges in inviting speakers and, in general, being a learning community in which all kinds of ideas can be expressed and discussed. According to Whittington, the cultivation of an environment that exposes students to diverse ideas as well as offering them the opportunity to express different ideas, is what makes the college campus crucial to the social maturation of a student body. Dr. Whittington explains the importance of avoiding speakers who may be delivering more dangerous speech, such as the harmful spreading of misinformation by Sandy Hook conspiracy theorist, Alex Jones, in comparison to more controversial speakers who should still be allowed to speak on campus, despite the disapproval of others. “Universities should provide security to events with controversial speakers, instead of altogether shutting down the event,” Dr. Whittington said. Ultimately, the tricky task of determining who should be allowed to speak at the university is a controversial matter. This was seen at UConn last fall, when the presence of Ben Shapiro, a conservative political commentator, and Lucian Wintrich, a far-right political speaker, made waves in the UConn community, especially considering the violent and controversial aftermath. Wintrich’s event last November ended with his arrest, as well the shattering of a window and a smoke bomb being set off. Following Shapiro’s speech in January of this year, protests were held outside the room and, counseling was not offered to anybody negatively affected by his presence on campus. Thus began the discussion of how free speech operates on campus. This was furthered by Dr. Whittington’s insights on the overall benefits a student may experience when encountering ideas in opposition to their own. Dr. Whittington’s presentation was followed by a robust question and answer section with the audience. Many of the students’ questions centered around the concern they had for the hate speech they may encounter under the principle of free speech on campus, and where to draw the line at information that is helpful or hurtful. Overall, Dr. Whittington addressed the question with openness to both sides of the argument. He reiterated that all kinds of ideas should be considered and to learn for oneself what will help enrich a student’s learning. Director of the Human Rights Institute, Kathryn Libal, raised the question of a university’s faculty involvement and learning of free speech on campus. She spoke of a class at her university that was shut down because of its topic: sexual orientation. Faculty should have as much of a role advocating for free speech as students and administrators. Students that attended the event appreciated Dr. Whittington’s openness and neutrality when discussing free speech. “What he discussed is very relevant to us as college students, and it’s important to understand and listen to opposing ideas,” Corey Akel, a third-semester economics major, said. In our tumultuous political environment, Dr. Whittington’s idea of political awareness and the learning and open environment of universities raises important points for students on college campuses as they transition to American society and face more controversial ideas of free speech.